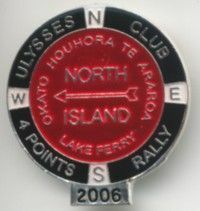 Thinking of doing the Manawatu 4 Points Compass Rally again this year. It works a bit like the Southern Cross except that it is only on the North Island, you get oodles of time to complete it in and it is a poker rally so there's the chance of a prize at the end. The 4 Points website is here. With the Connie wearing some brand spanking new Pirelli's it seemed only right that they should be put to some use and with it being Mother's day then I figured maybe I should really head up to the Bay to catch up with the olds. I started off by cruising up the main drag to Danniverke and spent a lot of my time waving to bikes going the opposite direction - this weekend was the Cold Duck Rally and all the rally goers were heading home. I think every cafe, garage and dairy on the road had a dozen or so bikes outside and there were certainly plenty on the road too. In Danniverke I topped up the bike before pressing on. At Matamau I turned off SH2 to head through Makotuku, Ormonville and Takapau before popping out on Route 52 (just for a second) and then into Waipuk. After trundling up SH2 to Waipawa I turned Eastwards and road through to Patangata and then Elsthorpe. From Elsthorpe I turned off onto Kahuranaki road which winds it's way Northwards towards Havelock North. It was a really nice ride through here with plenty to look at and plenty of corners to keep you interested. It's a country road though and there were two quite long sections of unmarked, unsignposted and unswept new seal - man I hate that. With just over 200km under my new Pirelli's I rolled up at the old's place and was able to sit down and have a spot of lunch with Dad. Unfortunately Mum was at work so I was forced to watch a replay of last week's Moto GP racing before she came home and we could catch up for a bit before I had to suit up for the trip back. Well my current set of PR2's (2nd set I've had on the Connie) have just hit the 12,000km mark and it's about time to consign them to the bin. Since changing from Pirelli Strada's I've been very impressed with the PR2's and certainly would recommend them for their performance and longevity on a large heavy tourer. 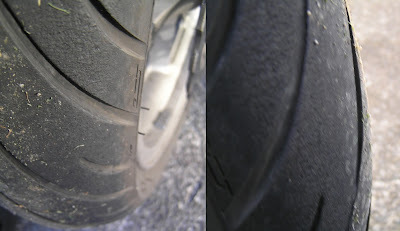 The profile on the front tyre is pretty much gone and the tyre is starting to not feel so nice on initial turn-in. Basically the effect feels like a slowing of turn-in and this takes away a bit of confidence when getting amongst it in the corners. The rear still has a reasonable amount of tread on the sides but it starting to look a little thin in the centre and I don't really want a puncture in the boonies if it can be avoided. (I was a little concerned riding on gravel the other day). So what am I replacing them with? Well, it was a toss up between another set of PR2's and the new Pirrelli Angel ST's. I've been keen to try the Angel's as they appear to be Pirelli's answer to the PR2 (both dual compound tyres) and also have heard that they're pretty good in the wet - Brian is also happy with his set on his Connie. Initially it looked like price-wise that PR2's were going to be the go but I managed to get a decent price on some Angels so a set will be going on this week. I look forward to trying them out and seeing how they perform against the PR2's - should know in about another 12,000kms...The worst thing that can happen is I go back to PR2's if not happy with the Pirelli's. Another fine autumn's day again so I was forced to take the Connie out of the shed for a little exercise. After a quick bite at home I was able to get on the road shortly after 12 so I had great plans on racking up quite a few k's before parking the bike up again. I started by cruising over to Feilding but then instead of heading directly through to Cheltenham and onto Vinegar Hill, I went out the back of Feilding and through Makino and then onto SH54 to Vinegar Hill. After cruising through Waituna West I stopped briefly at Stormy Point for a few pictures before continuing on to Hunterville. In Hunterville I discovered quite a serious error I'd made before leaving home - after filling the bike I discovered I'd left my wallet at home - Doh! And so, after giving the guy in the service station my details, I was on my way home as quickly as possible to find my wallet. My route home took me down SH1 before blowing through Halcombe, across to Mt Stewart and then back SH1 to get me home as quickly as possible. The dog was most upset with me when I only spent about 5 minutes at home before rapidly departing for Hunterville once again - no walkies for him. With Hunterville my destination again I had the perfect excuse to do Vinegar Hill again and once again it was a great ride, but no stopping this time. Back at the gas station I was able to pay for my gas and start to enjoy my ride again. I decided to turn towards Wanganui and take Mangahoe Road into wopsville. 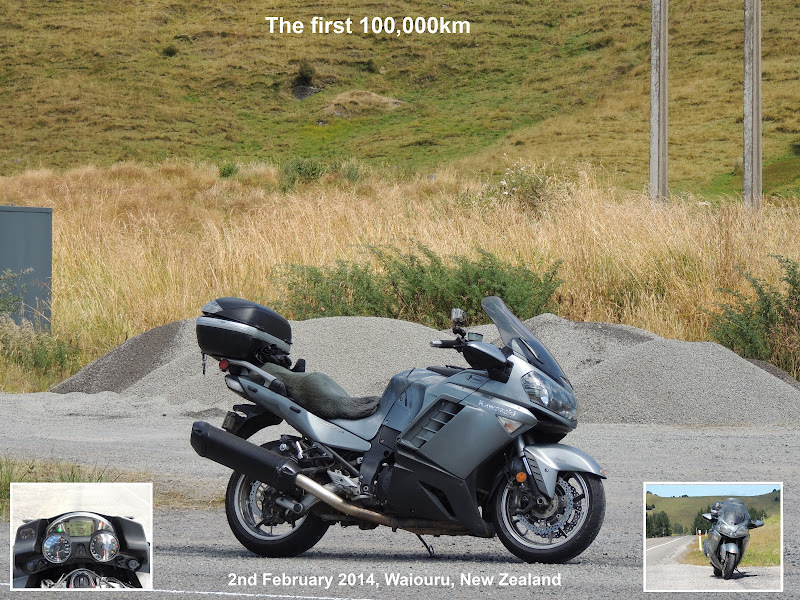 Instead of continuing on to Wanganui I decided to take Turakina Valley road back towards Marton. Not long after turning onto Turakina Valley road it turned to gravel but as I'd ridden this bit before I was pretty sure that there wasn't too much gravel and continued on. Sure enough, after about 5km I was back on the tar again and out of 3rd gear and into top. Once again I had a decision to make: on towards Turakina and Wanganui or hanger left and cruise Makuhou Road back to Marton. As it was getting later (and a little chilly) I took the left and settled in to enjoy Makuhou Road. This was the 3rd time in recent months that I've been through here and it's a great ride with a nice corners and plenty of scenery to look at. Eventually I ended up in Marton and from there I simply rode home via Halcombe and Feilding. Yet another magic day out on the Connie and another 300 or so km on her clock.